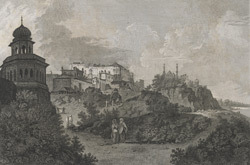 Engraving of a view of the Palace of the Nawab Asaf ud Daula at Lucknow by James Fittler (1758-1835) after William Hodges (1744-1797). Plate 11 of William Hodges 'Travels in India, during the years 1780, 1781, 1782, & 1783' published in London in 1793. The palace of Nawab Asaf ud Daula seen in this view no longer stands. According to Hodges, it was built partly Shuja ud Daula and greatly extended his son Nawab Asaf ud Daula. The palace was situated on the banks of the river Gumty. It had large courts within the walls and a durbar, or assembly room. On a high bank, shown on the right side of this view, there was a mosque with two minarets.